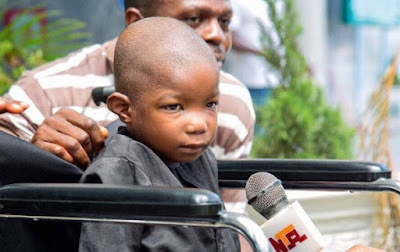 A six-year-old victim of the Boko Haram insurgency, Ali Ahmadu, has survived corrective surgery in Dubai after being in the Intensive Care Unit for 48 hours. Chairman of the Board of Trustees Igho Sanomi and members of the Dickens Sanomi Foundation, who sponsored this surgery, visited Ali in the hospital, a statement by the foundation said yesterday. During the surgery, doctors described Ali as, “a very strong boy who is determined to live”. Ali, who was left for dead under a tree after an attack by the Islamists on the Chibok community in Borno State in 2014, was flown out by the foundation for treatment to the Emirati city, where he underwent a successful surgery and started to walk again yesterday. According to Mr. Hassan Hua of Global Initiative for Peace, Love and Care (GIPLC), coordinator of the medical visit: “Young Ali’s recovery after surgery has been described as a miracle and very rapid, to everyone’s surprise. “Doctors had expected physiotherapy to start the process of his feet movement four weeks after the surgery. Determined to walk, Ali got up on his feet this Sunday morning, seven days after surgery and started walking. Nuhu Kwajafa, Founder of GIPLC, the organisation that coordinated young Ali’s surgery, said after the procedure: “After five hours in surgery on September 17 and 48hrs in the intensive care unit, to God be the Glory Ali Ahmadu Chibok had a very successful procedure and is currently stabilising and recovering. “My special thanks go to the National Assembly leadership, the Senate President and the media, for bringing public awareness to young Ali and for all their support. “In young Ali, we have a fighting spirit, a resolute and charming soul, beating all the odds to survive and walk again. This reflects so truly the Nigerian spirit, we are indeed grateful to God,” he remarked.